The breakneck pace of tar sands development in Canada is well known; it is the sheer size of the multiple mines, in-situ plants, upgraders, pipelines, rail lines, refineries and more across all of North America that earned the nickname “the Gigaproject.” Now, what if we took the most destructive aspects of tar sands mining, combined that with the worst parts of in-situ, and put them together into a project that was even worse than any tar sands development for the climate? What if the technology in Canada’s tar sands was used to open up potential oil deposits that could more than double all the known oil reserves on the face of the earth? That Canada’s “gold rush” of bitumen extractors are now seeking other places in the world to dig or attempt to pump tar sands into mock oil is not news, though certainly under-reported. But it is Oil Shale– not fracked “tight oil” trapped by shale, but rocks infused with Kerogen– a building block for synthetic oil much like bitumen (though composed quite differently) that is truly the ultimate prize for corporations the world over. But as Canada is to tar sands, Brazil and Estonia are to Kerogen/Oil Shale. For decades, both as a part of the USSR and now, Estonia has had both oil and electricity provided by extracting energy from Oil Shale. In fact, over 90 percent of both energy and pollution in Estonia comes from their oil shale mining industries. The state-owned company, Eesti Energia, has begun to carry out a rush on other locales. After the invasion of Iraq and the disaster of Katrina we had almost every major energy company in the world rush to bid on at least some level of asset in Canada to be used for later or immediately. A mad dash towards Alberta took place and is still happening, though not as quickly. From BP to Shell and Exxon to Conoco-Philips, Statoil, Japanese, Korean and Chinese companies, even TOTAL of France and multiple start-up local Canadian or small American corporations. The Oil Shale rush is taking place almost in the opposite manner. Almost every corner of the earth is now being staked, contracts are being signed and new mines are being proposed and in some cases, already constructed– but the main developers are only a few. Today in the world, only three countries are commercially producing oil from shale: Estonia (with Eesti-Energia), Brazil and China. There is much to be said about the plans of Royal Dutch Shell for this “bottom of the barrel of the bottom of the barrel” development; RDS deserves an entire piece unto itself. For now, let us identify corporations from these 3 “pioneering” countries who are attempting the creation of a world where food production, normal weather patterns, healthy, predictable seasons and life supporting eco-systems are designed for a museum. There are three main specific to kerogen oil-shale only types of extraction expanding around the globe. 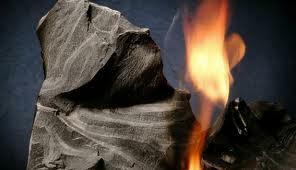 All are based on retorting– using heat after shale rock is crushed to ‘bleed’ kerogen out of the source rock. This often takes months, making it considerably more climate intensive than the worst tar sands in-situ operation– themselves already worse than mining. Estonia’s Eesti Energia has a procedure named “Enefit,” while Chinese developers have something they call the “Fushun process,” developed in oilshale mines that are in Manchuria, some 80km’s from the Korean border. Along with massive energy use, the Fushun process estimates some seven barrels of fresh water are contaminated by their extraction of kerogen. Then there is Brazil, who have developed what they titled “Petrosix” technology in their commercial oil shale mines in the south of their country, relatively close to the border with Uruguay and Argentina. Since 1953 they have been mining oil shale, and since the 1990′s they have been doing so for profit. However, the global expansion of Petrosix technology also borrows from Alberta-based technology and access, through multi-country partnerships with TOTAL SA of France. TOTAL collaborates with Petrobras directly in two of the places on the planet furthest along in being opened up for shale mining into oil: the Kingdoms of Morocco and Jordan. Eesti Energia of Estonia has also begun plans for work in both Jordan and Morocco, along with Serbia. TOTAL has also had a pilot, demonstration project underway in the single largest potential oil field on the planet. Enefit– the subsidiary of EE and also the name of EE’s retorting process– has a large stake in the Green River Basin of the United States (specifically: Utah, Wyoming and Colorado). Petrosix technology has also been looked into as a possible retort for the GRF, and TOTAL is part of a larger venture with Utah-based company “Red Leaf” to begin mining shallower deposits of the vast shale rock. This is only the beginning for companies involved and the countries they are using as a laboratory to get the dirtiest– and largest– single source of synthetic crude anywhere on earth. Other companies are also invested in R&D throughout the GRF, but as deposits around the world from Brazil to Estonia to China, Jordan and Morocco are opened up, the contribution of Jordan, Morocco or elsewhere in refining technological means to unearth the minimum estimated 800 billion recoverable barrels in the United States cannot be overstated. The emissions are guaranteed to be worse, given energy needs to heat the crushed kerogen-rocks. The destruction of water has been the barrier to such disastrous development in the Green River Formation up until today. And the amount of oil we are talking about? If industry estimates are true, the recoverable barrel number is almost five times more than exists in Canada’s tar sands, even with all four Albertan, the Saskatchewan and the Melville Island bitumen deposits combined. These companies– Eesti Energia/Enefit, TOTAL SA and Petrobras are the cutting edge of the Mad Max world of extraction the large energy corporations want to take the planet towards. There are others; Chinese, Korean and Japanese investments in such schemes in country after country also feed this. So too does the long term plans and reserve assets of Royal Dutch Shell, and new start up companies such as San Leon of Ireland, or Genie Energy of the US (and Israel). Globally resistance is more connected, intertwined and interwoven than ever. It must remain and expand at that level, because if we thought that climate justice organizing was going up a sisyphean mountain, we need to recognize the size of the behemoth. In the size lies the transformative hope, however. If organizing to dismantle this can begin, it will have to take place at an international level, and discard nationalist sentiments entirely. And that has always been the only means by which we can even hope to address climate change, anyhow. We must now be humble, march slowly and most important: we must be good at learning on the fly. With each other– in every time zone and on every continent. We must invert the old slogan, “nothing to lose but a world to gain.” We have a world to lose, but for the bulk of humanity and other life on the planet, there is nothing to gain from an unchecked, fossil fuel descent into climate chaos brought about through these mock oil monstrosities. One first step in addressing this reality is information: Multiple countries and different plans are now laid out in one place, at www.tarsandsworld.com– and here you will find information on both what is being planned, and recent developments in terms of resistance on a global level.